This pattern is designed to be a full scale pattern for the crafts hobbyist. Perfect for building a tulip shaped basket for spring. Free instructions at Dexter A. Hansen. 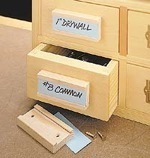 I made drawer pulls that double as label holders, as you can see in the photo. Here is how I did it. This pattern is is designed to be a full scale pattern for the crafts hobbyist. Perfect for making an Easter basket. Free instructions are at Dexter A. Hansen. This pattern is designed to be a full scale pattern for the experienced crafts hobbyist. This is fun to paint and a great Easter gift. Free project at Dexter A. Hansen. This pattern is designed to be a full scale pattern for the experienced crafts hobbyist. This basket looks great on a tabletop with napkins or fruit in it. Free project at Dexter A. Hansen. This pattern is designed to be a full scale pattern for the experienced crafts hobbyist. This egg basket is fun to paint and great around Easter time. Free instructions at Dexter A. Hansen. Build a A small storage cabinet for CDs. Hanging address plate for house numbers. Includes two ideas for the top and a nameplate for below the house numbers. DXF Format, scroll down the page to find it.